Lineas has started shunting activities in the Maasvlakte-West, an extension of the Port of Rotterdam. Three locomotives were taken into use. It is the first time the Belgian operator gains foothold in the Dutch port. The shunting activities of Lineas commenced on 2 January this year. From Maasvlakte-West, the company also runs the last mile to and from Maasvlakte and Botlek. In the future, it will be able to bolster higher volumes, the company noted. For the new activities in the Netherlands, Lineas is leasing three G1206 locomotives. These powerful locomotives have the ETCS which is required to operate in the Netherlands. To enhance their presence in the Rotterdam Port, the first locomotive (no. 5001511) will be decorated entirely in Lineas colours. In addition to these G1206 locomotives, Lineas has 24 other diesel locomotives and 48 electric locomotives that are allowed to run in the Netherlands. “Thanks to the new activities and our locomotives, we have now really anchored our presence in the Rotterdam port,” explains Matthias Herrebosch, Director of Commercial Operations at Lineas. 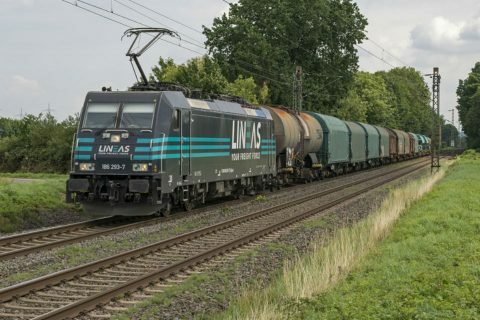 Lineas currently offers flexible railway connections between the ports of ANtwerp and Rotterdam with its Green Xpress Network transport. This innovative and flexible concept enables small rail volumes to be transferred to international destinations. So, goods from the Randstad can be transported to the Ruhr area, Sachsen, Switzerland, France, Eastern Europe, the Balkans, Scandinavia and other European destinations. “Both the shunting and the last mile activities as well as the transport from Rotterdam to a range of international destinations are an example of Lineas’ intensive expansion as a provider of good-quality, reliable and environmentally friendly logistics solutions in Europe”, added Herrebosch.